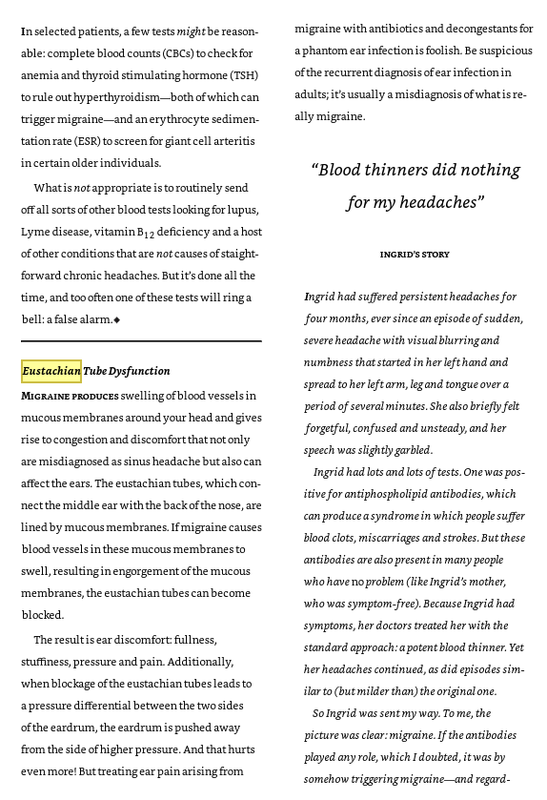 Snippet from “heal your headache” book on Eustachian tube dysfunction. I think this book has a lot of good detail for MAVers. Sounds compelling, but what starts the migraines? And clearly less compelling for those with uni-lateral rather than bi-lateral symptoms. And also not compelling as a root cause for people who’ve had this symptom long before any migraines. However, you can imagine there is potential here for a vicious cycle and no matter what started the migraines, these symptoms worsen the situation because they impact the pressure in the ear? Then you turn migraine into MAV? The superficial answer is always “because they are migraine prophylaxis drugs” but this doesn’t begin to describe the detailed process behind that and is just based on correlation between application and symptoms, presumably, rather than a bottom up analysis. Venlafaxine definitely dries you out - I suffer dry mouth anyway but when I was on Ven recently the dry mouth was so so bad. Amitriptyline is a particularly effective drug. We know it calms the brain, we know its a vestibular suppressant, we know it reduces nausea, we know it reduces pain and we know it reduces mucus output … no wonder that’s a go-to prescription!! You are talking about topical action in terms of vasodilation and vasoconstrcitors. But if Propanolol and Candesartan can control the migraine then that should help with the ETD as well. Anything that works on the migraine should help resolve ETD caused by migraine. If only Ami didn’t cause my heart to race…I might have had some success…it was the 2nd drug I tried but GP took me off it after 6 days…I wonder if Nortriptyline would have the same heart effects? I was misdiagnosed with eustachian tube dysfunction for 6 years before getting the vestibular migraine diagnosis. I had an audiogram that proved there was no fluid in my ears, the pressure was fine even though it feels as if my ears are full. 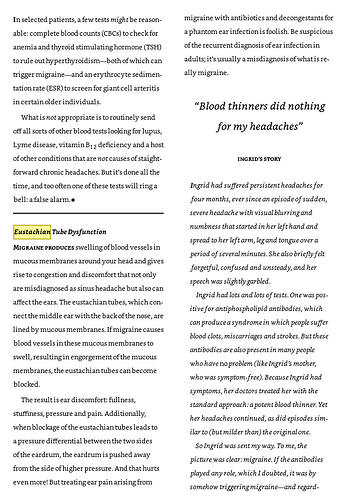 The HYH theory that migraine does cause eustachian tube blockage because of swelling blood vessels is interesting! It certainly makes sense, and should definitely not be treated with decongestants because they are known migraine triggers, i can vouch for that. But if it does literally change ear pressure, and literally causes etd, then why are audiograms of mav patients usually normal? I’ve always wondered how mav causes ear fullness without there being any trapped mucus. I should tell the gp who misdiagnosed me to read this. , then why are audiograms of mav patients usually normal? Good question. I have HF hearing loss but was diagnosed with MAV originally. I believe @GetBetter has definite and fluctuating hearing loss? The thing is though, no matter where you are on this debate, what is causing the migraine? This is why I’m sceptical of the migraine ‘explanation’ because it doesn’t explain itself. migraine as a result of brains irritation with inner ear signals that no longer correspond to other ear. The other weird thing is why would this be unilateral, ever? Maybe some patients simply have more susceptible anatomy on one side? It’s really really weird. I don’t have any hearing loss but i know sone people with mav do but how is that explained? It’s common for some migraine to be one sided. Most GPs believe migraine is one sided pain, that’s how it’s mostly described, and why so many people get misdiagnosed. Could this one sided thing be why it sometimes only affects one ear? Could this one sided thing be why it sometimes only affects one ear? Could be … I was even more sceptical until I started to understand the swelling and mucus thing. And this could explain your ETD diagnosis - don’t be too harsh on those doctors because, who knows, this might be part of the problem but has a different cause than infection. I don’t actually blame the misdiagnosis, it’s understandable. GPs can’t know what they aren’t taught, and they openly admit they aren’t taught much at all about migraines. It was the dismissive attitude of the gp that i blame. The other gp i saw said she would not have had me wait months at a time with ongoing symptoms, i should have been told to go back in a few weeks if i was no better, instead of being told to wait months and there’s nothing we can do. Even if it had been etd, if it doesn’t relieve itself in a few weeks there is a problem that needs addressing, an allergy perhaps or the patient needs plugs fitted to drain the fluid. Someone with suspected etd shouldn’t be told there’s nothing we can do and ut can take months, especially repeatedly over the course of 6 years. Unfortunately i have seen others with actual etd (diagnosed correctly) told the same thing, partly because the nhs doesn’t want to spend the money on fitting the plugs or allergy testing, and hope that the etd clears on its own. Over the past few years the number of children getting the plugs fitted has dropped dramatically because the nhs is trying to save money, even though the number of kids getting ear infections as a complication of etd has risen. But i completely understand why i was misdiagnosed and i respect that. Especially when there are no tests to prove anything. Although, one of the experts at the migraine summit last year said “we used to pooh pooh ear pressure wgen migraine patients told us, we thought it was unrelated etd. But now we know otherwise”. Maybe if they didn’t pooh pooh patients, they’d understand more. Aaaaanyway, going off topic, sorry. “we used to pooh pooh ear pressure wgen migraine patients told us, we thought it was unrelated etd. But now we know otherwise”. Well you know my path here is different. I injured my ear physically and I ended up with periodic fluid in my ET. I began to ignore it after dizziness went away 5 weeks after the injury. Unfortunately 5 months later I was hit with the MAV symptom spectrum, so it appears that chronic though intermittent ET blockage might cause MAV. If you have a condition which keeps blocking the ET of its own accord, well, vicious cycle! (an alternative explanation is I originally leaked perilymph from the inner ear, and as the breach healed, I developed a chronic inflammation (and over production of mucus) in my middle ear as part of the healing process). That’s why I’m so interested in the true action of so-called migraine prophylactic medicine. One of the main effects is that it reduces mucus production (dry mouth side effect anyone?!). This seems hugely significant to me. So to me, this could be a syndrome of systemic failure, when the process of maintaining harmony has broken down. There must be so many different reasons why mav develops. Injury, as you said… Hormones… Viruses. I had a viral ear infection when my mav symptoms began and when it disappeared the mav symptoms didn’t. Sometimes i wonder if the cold virus did something to my ear. It was only a mild infection, nothing that did any physical damage, but did it trigger an immune response that triggered mav? Every time i catch a cold or even a stomach bug, my mav gets reaaaaally bad. There’s a throry floating around that migraines could be an autoimmune disease. I want to do some research on why typical migraine presents with one sided symptoms, but I think it has to do with the brain having two hemispheres, and how cortical spreading depression works in the brain. That would make some sense, as when migraine occurs in the brainstem region, the symptoms are different and more global. While the classic definition of migraine is a one sided headache, it is expected that migraines should at least occasionally switch sides. A truly side-locked headache is actually a red flag symptom for a neurologist, prompting a brain MRI. That is my situation. Facial pain/pressure, eye tearing, tinnitus, stuffy nose all on the left. My symptoms have progressively gotten low grade chronic, and I was found to have cervical spine major issues on the left side only. But that’s just my specific case. With unilateral ear symptoms that persist in migraine patients, it’s hypothesized that migraine altering blood flow to the inner ear may cause low level damage that persists. Some think migraine may cause a “mini stroke” in the inner ear. But I agree that if these were the case, one would see the damage on audiograms or VNG/Caloric testing, which are usually normal. My own theory for unilateral tinnitus/hearing symptoms that persist or fluctuate with normal inner ear testing/normal MRI (and no frank Menieres patterns), is that it is a form of somatic tinnitus, irritated cranial nerves - triggered by muscle spasm, which can be caused by migraine, amongst other conditions. The thing is though, mine started out as an ear injury. I had had one migraine in my life, maybe 15 years before. So the common elements appear to be the ear symptoms, not the migraine, initially. I developed migraines much later even after the 24/7 dizziness when my symptoms became identical to MAV. The difference appears to be that I’ve gone into remission after 3 or so years and, touch wood, get better month by month. So is an ear injury that causes middle ear inflammation having the same impact as migraines and both turn into MAV? Or are the non-ear-injury sufferers, have they got another condition that has as yet not been identified? I think that should be a scientific line of enquiry. I honestly think it is probably several different things happening to all of us, and we’ve been lumped into one diagnosis because the doctors don’t know. Supposedly we scientifically know that migraine is a genetic, neurological disorder. There are people diagnosed with VM that have never had one migraine in their life, but have a family history. Buccholz claims anyone is capable of getting migraine if they exceed their personal threshold. It is also entirely possible to have migraine disease in your genetics (which would be a genetically low threshold according to Buccholz), and something brings it out later in life. Head injuries are known to do this. Maybe your ear injury did as well? It is also possible to have migraine coexisting with other separate issues- issues that may remain undiagnosed, and may even trigger migraine activity. Did you happen to perforate the ear drum when the shower hit it?